View latest news items and search for older stories by keywords or category. Stewart Hastie died suddenly on 21st February 2018, aged 95 years. Stewart, a Scotsman, was a graduate of the University of Glasgow and worked as a veterinary surgeon for 74 years, focussing predominantly on horses throughout his career. After graduation in 1944, Stewart first worked in general practice in Kent, before moving to Buckingham to set up an equine and small animal practice. The practice, Hastie and Jenkerson, was where he was to meet his wife of 24 years, Jane Nixon, who came to work there in 1978 and who became a partner in 1983. Jane and Stewart founded Nixon Equine Veterinary Practice in 2005, which was to be rebranded and sold as Buckingham Equine Veterinary Practice in 2011. In a tribute Buckingham Equine Vets said, ‘When he retired from hands-on veterinary work he left a legacy of pursuing the very best in clinical excellence, while maintaining the highest standards of professionalism. As a practice team we still strive to achieve these principles laid out by the father of our practice many decades ago.’ Stewart, however, did not really retire and remained very much involved with Nixon Equine Veterinary Consultancy, providing advice whenever asked for and when not! He had strong opinions and was never shy in coming forward, but he was also ready to listen to others and to learn. Stewart was of the old school of veterinary surgeons with a background steeped in horses and a real passion for the horse. He was an observer, a questioner, a reader and a thinker. He was ahead of his time, recognising the importance of correct foot balance and appropriate shoeing, realising that saddle-fit for the horse was imperative for optimal function and embracing appropriately trained paraprofessionals as part of the team required to promote equine health and welfare. He recognised that learning never ended and his thirst for new knowledge continued unabated throughout his life. Stewart was a gentleman, with high professional ethics. Woe betide anyone who transgressed these principles when he was in practice. He had an amazing memory and, combined with his wit and sense of humour, had plenty of tales to tell from throughout his extensive career. Stewart was intimately associated with many facets of the equine world, most particularly hunting, working hunter showing, eventing and racing. He supported eventing as a life time member of British Eventing. He was Veterinary Advisor to the Society of Master Saddlers and was recognised as an Honorary Fellow of the organisation. He delivered the inaugural lecture on the History of the Saddle to the Worshipful Company of Saddlers in 1983. Stewart was passionate about education of the horse-owning public and was intimately involved with the British Horse Society. He wrote two editions of The British Horse Society Veterinary Manual and received an Award of Merit for Welfare and Training from the British Horse Society. 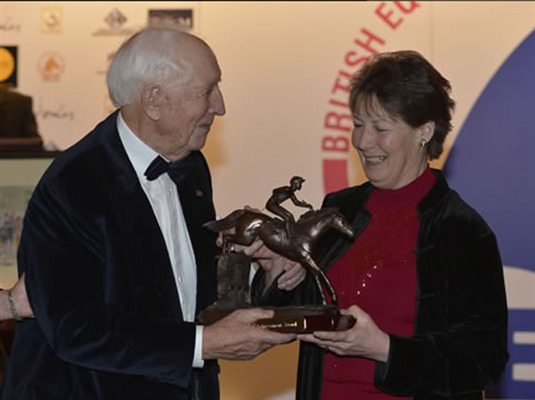 His contributions to the equine industry were recognised by the award of the British Equestrian Trade Association’s Life Time Achievement Award in 2013. Stewart also played an active role in veterinary politics serving as Secretary to the British Veterinary Association in the 1960s and acting as both Honorary Secretary and Honorary Information Officer for the British Equine Veterinary Association in the 1970s. Stewart was a passionate believer in continued professional development and was an avid supporter of BEVA meetings until very recently. Stewart provided unwavering support for his wife Jane and her work. Despite suffering a total right-sided stroke in 1999, Stewart’s indomitable perseverance and determination shone through. His gait was impaired, but Stewart still found ways to accompany Jane on the majority of her professional visits. They were a formidable team in the nicest possible way, forged from 40 years of working closely together. As the British Horse Society have said, Stewart’s past and continuing contribution to the equestrian world was an inspiration for all of us involved with horses, enhanced by his sense of humour and captivating wit. I have been fortunate enough to know Stewart throughout my entire professional career. His powers of observation, thirst for knowledge, willingness to engage in debate and change his mind, and his overall passion for the horse and equine veterinary medicine have always shone through. There will be a celebration of the life of Stewart Hastie on 24th April, at 11.30, at 1905 Suite, Whittlebury Park, Towcester, Northampton, NN12 8WP. All are most welcome. Please advise cphastie@yahoo.ca by 6th April if you wish to attend. Donations to ‘The Stewart Hastie Veterinary Student Champion’ programme, The British Horse Society, Abbey Park, Stareton, Kenilworth, Warwickshire, CV8 2XZ.